This is space opera, Pinoy style. With Mythspace, I can imagine reaching for the stars, while digging into my own Filipino roots. 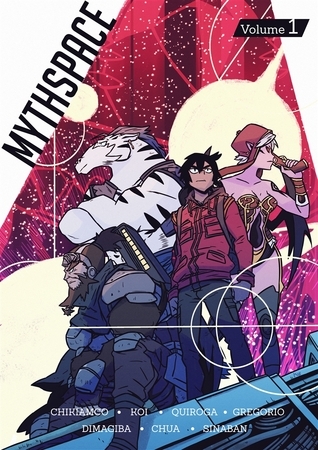 Mythspace is not your typical Filipino graphic anthology. It presents 6 stories of a similarly connected vein, 6 stories that share the same kind of odd universe. This is a universe where kapres own starships, where manananggal can be among the most respected thieves, and where the dwende, tikbalang, and bakunawa have their own high places in the galaxy. Oh, and it mostly takes place in outer space, so there's that, too. It sounds crazy, but the story-craters of this volume have delivered quite an experience. Not only did I look at alien tech and different planets through their eyes, but I was also brought back to the stories of old that my own generation has now forgotten. They were able to mesh well old mythological creatures with their possible intergalactic personas, highlighting their old strengths while giving them powers that suit their personalities. Moreover, the stories themselves are rich with detail and thoughtfulness. These are stories not just of glorified heroes and weird plots, but also of poverty, of longing, of strength, and of character. Their mythological/sci-fi backdrop is merely a vehicle for them to portray complex stories that can be funny, sad, or even surprisingly real, but they all do have heart. So read Mythspace to find out about daring adventures and curious tales. They may touch you, interest you, and surprise you in the most unexpected ways. After all, this is space opera, Pinoy style.